During the four years we've lived here, I've regularly shown family and friends old and new round the house and explained our plans - this wall will be knocked down, this will become glass, we're putting a window here, and extending the wall there. I would usually see a few glazed expressions while doing this, probably because surprisingly no one else found our renovation quite as fascinating as I do ;-) or maybe because I never did a very good job of explaining how things would look. Seeing the vision for our house come to life in reality has therefore been absolutely wonderful, and all my worries over the years about whether it would feel big enough, or light enough, or open enough, or too open, have been completely allayed because in fact it's perfect. Warning - picture heavy post coming up, with a few bonus wide angle shots. And now with all the plaster taken off and the right hand side of the wall knocked down. And with the wall knocked down (with chipboard separating it from the living room to keep the dust in). 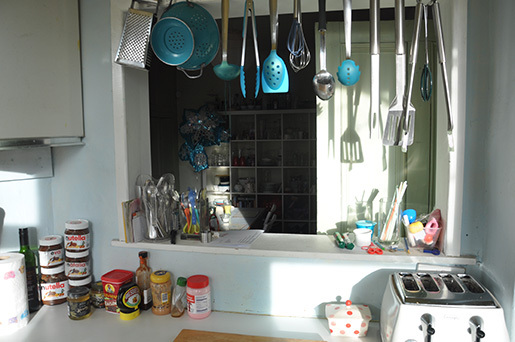 Moving across to the other side of the house - here's the old kitchen. When we moved in, it was yellow and green. We painted it blue and white after a few months. And then a couple of weeks ago, it was ripped out. I declined to closely examine the detritus discovered lurking underneath the cabinets. And here's how it looks now the wall separating them has come down. Also, giant unexpected fireplace! Which naturally called for a giant unexpected fireplace selfie. And with the frame for the cloakroom/buggy store in place (which will be accessed from the hall). The original door to this room on the right has also been removed and the opening widened. And a wide-angle view of the room. This is one of my favourite shots. 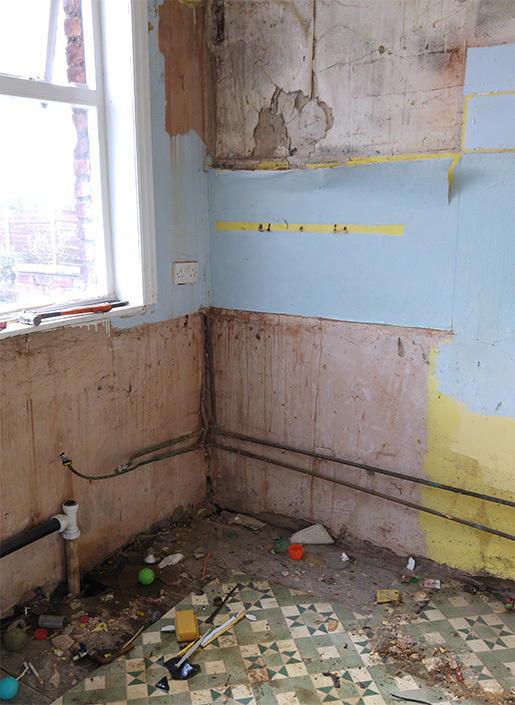 I've been explaining for years that we'd be taking this old kitchen wall down and linking up with the other side of the house to create a big c-shaped space, so when the builders finally knocked the wall down I was hopping up and down with excitement. Bay window still in place. The brick wall with the drainpipe in the middle of the new breeze blocks and the bay window is the wall that was knocked down in the pictures above. Bay window begone. Keep an eye on that wall on either side of the larger yellow prop below. And the new opening to the old kitchen. That yellow and blue room has never looked better. Note you can still see the drainpipe to the left - this will be boarded in and sound-proofed. Wide-angle shot of the space. This is clearly how estate agents take pictures as it makes the room look bigger than it actually is in reality. And finally - into every temporary cellar kitchen, a little dust must fall. Here's Josh putting his head through the hole in the plaster-and-lath ceiling after Ben (pictured grinning sheepishly) put his foot through the floor in the room above. A voice from above: "&%*$". Followed by: "Joooooooosh!". Naturally we thought it was hilarious and took a bunch of photographs and immediately put them on Facebook.